Right click -> view image to make this bigger. 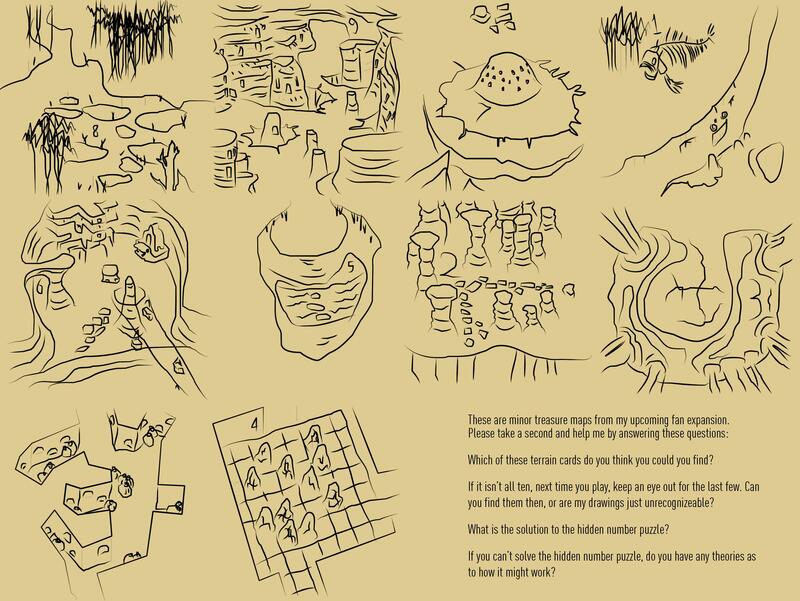 These are minor treasure maps from my upcoming fan expansion. Which of these terrain cards do you think you could you find? If it isn’t all ten, next time you play, keep an eye out for the last few. Can you find them then, or are my drawings just unrecognizeable? What is the solution to the hidden number puzzle? If you can’t solve the hidden number puzzle, do you have any theories as to how it might work? The location that doesn't have a number actually doesn't have one, it has a slightly different purpose, there is not (yet) a 0. The best way to answer is just to post your best guess for the 10 locations and the hidden number in spoiler tags. First question: I'm pretty sure I could find all ten locations. Your drawings do a very good job at signaling them. Second question: I don't yet have any idea how the hidden number puzzle works. I would have assumed the numbers were a private system to track the drawings that would be removed in the final version of the cards if you hadn't told me there was a puzzle. If I come up with a theory I'll see if I can't edit it into this post with a spoiler tag. It occurs to me that I was not very specific about what I mean by a Hidden Number. The 9 maps with digits are all the same 1050, you get them from (among other things) a character skill called Examine the Map, on one of the new characters in my fan expansion. Imagine you have all 9 of those. The 10th map in the bottom right is not a part of this puzzle and you can forget it exists for now. It is not a 1050. So, you've collected all the map fragments, and they have numbers on them. Numbers are always suspicious in the 7th continent, usually they can be combined in some way for a number, usually with other suspicious numbers on other cards. This puzzle is one of those. Somewhere in the adventure deck, there is a card with a for 1050 + 1050 + 1050. Your goal is to figure out what number you would need to check to get it. I'm sure I can find 9/10 locations. I had never seen the location #0 before but I have yet to visit the whole continent ! Try to check if the digit hidden on each map has a relation with an element (like number of stones...). Not revelant. Build a logical path between these location on the continent, but there are so multiple access for each of them. #7 and #9 for sure, and maybe #8 or #6, I don't remember for sure. ==> I will check the 976 card for example. Last question : if these clues are on 1050 cards, it means that your extension is mainly over 1000, so I maybe have to find an hidden number with 4 digits ! No ? None of these guesses is quite right but they are very close. This is definitely the kind of thinking you need to solve this puzzle. I advise having the physical cards to solve this puzzle but you needn't examine them under a microscope or anything. The hidden number is currently only 3 digits. I could rework it to make it 4 pretty easily and I actually probably should just so I can put it on a less conspicuous card. I assume #0 you mean the bottom-left one that doesn't have a number? That one isn't part of the hidden number puzzle, but i've been convinced to add an actual #0 map to the puzzle, if I don't decide to take the numbers off of the maps where they're just a red herring. So I'll try to find later ! - The bottom-left one, but the corridor of the gallery has a shape of 3. - The bottom-right one (2nd line): by deduction, it is the #0 (in addition, the circular shape seems to be a confirmation.). The bottom-left one does not have a number. It is the one some people think is supposed to be the 0, but actually it doesn't have a number at all. It's actually the front of the card whose you're trying to find, in the tradition of treasure maps there's a final step to collect your prize. #3 is in the middle right. It is the subtlest of the numbers right now, tucked away in the curls of the lava. One good strategy might be to sorta play a run and just like cheat as much as you want not drawing cards on things, explore to the various locations, see if anything sparks. I super appreciate you sticking with it, by the way! Thanks so much for helping!